If human beings disappeared instantaneously from the Earth, what would happen? How would the planet reclaim its surface? What creatures would emerge from the dark and swarm? How would our treasured structures--our tunnels, our bridges, our homes, our monuments--survive the unmitigated impact of a planet without our intervention? 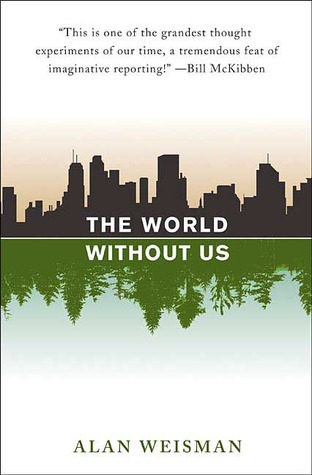 In his revelatory, bestselling account, Alan Weisman draws on every field of science to present an environmental assessment like no other, the most affecting portrait yet of humankind's place on this planet. 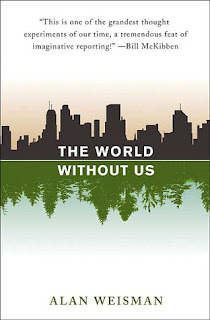 Alan Weisman does a fantastic job at putting his post-human vision on paper with his book, The World Without Us. The entire book is a collection of facts, quotes, and interviews turned into beautiful prose creating a timeline of what nature would do without homo sapiens intervening. Chapter by chapter, Weisman takes a look at various aspects of our every day lives, our history, and our legacy while astounding readers with facts that will have their mouths hanging open in disbelief. The book is split into four different parts each exploring what would happen to various parts of the world when humans are gone. How long would it take New York City to disappear? Would the faces on Mount Rushmore welcome the next inhabitants or would they be worn down to smooth stone? How would endangered animal populations end up without us to protect them/destroy their homes? These questions plus a thousand others are all asked and answered in Weisman's book. It is cleverly put together, all the while adding up to one thing: nature will fight to reclaim the world. I can't believe I've waited this long to read through The World Without Us, especially since I bought it when it was first released in 2007. However, this book is rather hard to comprehend at times, as it is scientifically written. It is an imaginitive study that doesn't slack on research or description. I think that's what deterred me from it for so many years. But even if you need a dictionary beside you, I highly recommend that everyone read this book.